This Passive House project was inspired by the success of the Islington Council’s Mayville Community Centre. 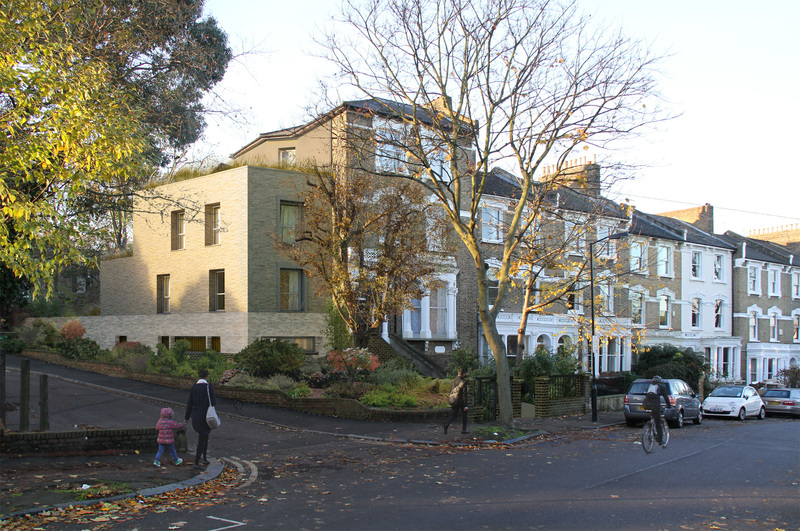 The project will restore a council-owned street property that was suffering from subsidence, providing revolutionary new all-electric apartments built to the Enerphit standard. The cost of the improvements will be paid for by the income from constructing and selling a new Passive House 3-bed family home built to accommodate a disabled person. The new-build family house is built on the site of a former car park, and by removing the cars, we can replace the modern entrance stairs to the historic house, with their strange geometry, replacing them by a more accessible, traditional staircase. The form of the new house is dictated by the site, so it widens towards the rear, allowing for a generous south-facing living area. The house has contemporary interiors and being a certified Passive House, will benefit from very high levels of thermal comfort and air quality. Green roofs to the rear will provide an attractive outlook, and natural habitats for flora and fauna.